The year 1916 was marked by an achievement: women won the right to vote in Manitoba, Saskatchewan, and Alberta. To highlight the centenary of these victories of Canadian women in their struggle for enfranchisement, this thematic ensemble of the “Women in the DCB/DBC” project brings together the biographies of women and men that deal with the history of women’s suffrage in Canada. In the colonial era the right to vote was granted essentially on the basis of criteria related to age, origin, and property and, for a long time, no law formally prohibited women’s suffrage. During the earliest elections held in New Brunswick in 1785, the Executive Council did indeed limit the right to vote to men, but the restriction was not incorporated into the colony’s first election act, passed in 1791 and sanctioned in 1795 by the British crown. 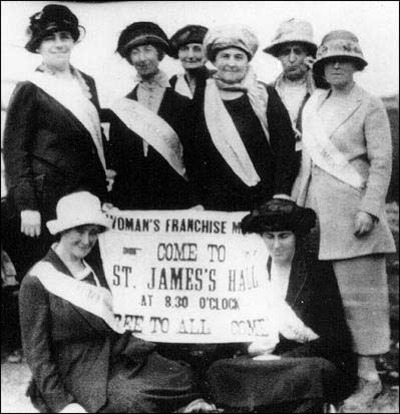 Since there was no statutory restriction, women who wanted to vote and met the criteria did so in New Brunswick and Nova Scotia despite conventions in common law that would otherwise have prohibited the enfranchisement of women, as it did in Great Britain. Some women, however, were refused access to polling stations or had their votes nullified. The Constitutional Act of 1791 conferred the right to vote in elections for the legislatures of Lower Canada (present-day Quebec) and Upper Canada (present-day Ontario) on British subjects who were at least 21 years of age, had never been sentenced for a serious criminal act or treason, and owned or rented one or more properties of a certain value. There was no specification of gender. Thus, there was nothing to prevent women who met these criteria from voting. Since the Coutume de Paris – civil law – that prevailed in Lower Canada did not check this practice, a few thousand women took advantage of this situation and voted between 1791 and 1849. For their part, the women of Upper Canada, who were subject to the conventions of common law and cultural restrictions similar to those that hindered the exercise of women’s right to vote in the Maritimes, with the exception of a few cases, stayed away from the ballot boxes during this period. Between 1834 and 1851 legislatures in each colony enacted laws that excluded women from voting. In March 1834 the assembly of Lower Canada adopted a law on contested elections, to which was added a provision prohibiting women’s suffrage. This provision and its adoption were the achievements of members of the legislatures and of the elites, such as Louis-Joseph Papineau and Joseph-Rémi Vallières de Saint-Réal. For several years they had been demanding that the right of the women in Lower Canada to vote be withdrawn. To make their case, they invoked the need to protect women from violence at the polls, and maintained that the act of voting was incompatible with the nature of women. The adoption of such a ban had probably been influenced by the Representation of the People Act, passed in the United Kingdom in 1832, which, for the first time, formally confirmed the restriction of the right to vote to men. In 1836 Prince Edward Island also banned women’s suffrage. However, in February 1837 the Colonial Office disallowed the law on contested elections in Lower Canada – not because of opposition to the provision suppressing women's suffrage, but because of another section of the statute that allowed the legislature’s committees to pursue their work after prorogation. In 1843 the New Brunswick assembly in its turn limited the right to vote to men. The situation remained unchanged in the Province of Canada at the beginning of the 1840s. Growing ultramontanism in Canada East (Lower Canada; present-day Quebec) and controversy over a closely contested ballot in Canada West (Upper Canada; present-day Ontario) in 1844 seem, however, to have led to new developments. A reformist candidate who lost by four votes in the riding of Halton West challenged seven votes cast by women in favour of his conservative opponent. Not surprisingly, a committee of the legislature controlled by conservatives confirmed the legitimacy of the votes, putting a seal on the reformist candidate’s defeat. In May 1849 the reformist government of Robert Baldwin and Louis-Hippolyte La Fontaine, with almost no opposition, changed the law to prohibit women from voting in elections for the legislature and the municipal councils of the United Province of Canada. Nova Scotia followed suit in 1851. Thus, at the time of confederation in 1867, the country’s four founding provinces disallowed women’s suffrage, whereas, before 1851, women had voted in these provinces. Women were also deprived of the right to vote in federal elections, which were subject at the time to provincial laws. A suffragist movement took shape from the 1870s, first in Ontario, particularly under the leadership of Emily Howard Jennings (Stowe), and then in the other provinces. Local, provincial, and national associations, such as the Dominion Women’s Enfranchisement Association (1889), were established. Various actions (for example, drawing up petitions, writing newspaper articles, and giving talks) by members were added to many individual initiatives. As was the case elsewhere, Canada’s suffragists had to confront degrees of indifference or opposition from men and women who were unconcerned about the question or who mocked their demands or were openly hostile. The suffragist movement benefited from the involvement of people fighting for other social reforms, such as the control of the sale of alcohol or Prohibition, the improvement of working conditions and professional opportunities for women, their access to better and higher education, and equality with men. These individuals joined in the struggle with the conviction that gaining the vote for women would help bring about concrete action in response to their own demands. Furthermore, many suffragists in Canada such as Emma Sophia Skinner (Fiske) exchanged ideas, arguments, and strategies with their counterparts abroad through correspondence, participation in international events, communication about speaking engagements in Canada, or involvement in the struggle to gain women’s suffrage in other parts of the world. Women gradually acquired the right to vote in municipal elections during and after the 1870s. Each provincial legislature determined the eligibility criteria for casting ballots in municipal elections and modified them over the course of the following decades. A sign of divided opinion on the subject was the revocation of this right in some provinces and its subsequent reinstatement. For example, the right was granted in Manitoba in 1887, abolished in 1906, and then granted again in 1907. Authorities in some municipalities also adopted – or tried to adopt – rules to change the criteria. A case in point: the Montreal municipal council considered narrowing them in 1902 by excluding women who were tenants, but gave up the idea when suffragists mobilized against the measure. Many different scenarios based on this issue played out across the country. The right to vote in provincial ballots was granted in three western provinces (Manitoba, Saskatchewan, and Alberta) in 1916, and in Ontario and British Columbia the following year. These victories, the result of persistent and peaceful efforts of significant figures in the history of women’s suffrage in Canada, such as Helen Letitia Mooney (McClung) and Maria Heathfield Pollard (Grant), encouraged suffragists to increase pressure on Ottawa. Anxious to facilitate its re-election at a time when the debate on conscription was raging across the nation, the government of Sir Robert Laird Borden in 1917 granted the right to vote in federal elections to female British subjects on active military service and to certain female relatives of members of the armed forces (they had to be British subjects and qualified by their age, race, and residence). The measure, decried for its political opportunism both by the opposition in the House of Commons and by many suffragists, prepared the way in May 1918 (less than a month after women’s suffrage had been won in Nova Scotia) for the extension of the right to vote in federal elections to all female British subjects aged 21 or over who met the property criteria in their province of residence – the same conditions as those that applied to men. In 1920 only age and citizenship were retained as eligibility criteria for the majority of both men and women. Some restrictions remained – for example, those specified by legislation that applied to members of certain religions or races – and they would gradually be lifted over the course of the following decades. New Brunswick, the Yukon, and Prince Edward Island, as well as the Dominion of Newfoundland, which was to join Canada in 1949, followed the federal lead and granted suffrage to women between 1919 and 1925. Suffragists in Quebec, up against the stubborn resistance of the influential Roman Catholic clergy, many members of the political class, and virulent opponents such as Henri Bourassa, had to wait until 1940. Women who lived in the Northwest Territories were finally enfranchised in 1951. Winning the right to vote in the provinces and territories was accompanied by the possibility of running for elective office. However, the right to stand for election, or the right of eligibility, was granted later than the right to vote in Ontario (4 April 1919), and New Brunswick (9 March 1934), and at the federal level (7 July 1919). Until 1950, renouncing Indian status [see Frederick Ogilvie Loft] was mandatory for aboriginal men and women who wanted the right to vote in federal elections; this policy stemmed from the process of planned assimilation set out in the Indian Act of 1876. There had been some exceptions: for example, in 1944 men who were status Indians and had served during the Second World War gained the unconditional right to vote, and the same right was extended to their wives. In 1951 aboriginal women who were status Indians acquired the right to elect members of band councils and to run for seats on the councils. Then, between 1950 and 1960, the right to vote in federal contests was awarded to aboriginal men and women in exchange for renouncing the right to tax exemptions attached to Indian status. Finally, in 1960, the federal government of John George Diefenbaker, backed by almost all the members of the House of Commons, granted men and women who were status Indians the unconditional right to vote in federal elections, which meant they would not have to renounce their status or certain related rights. Between 1949 and 1969 most provinces also granted voting rights to aboriginal men and women with Indian status. However, some aboriginal women may have gained the right to vote in federal and provincial elections before the adoption of these laws relative to their status. An aboriginal woman who married a non-aboriginal man, or who married an aboriginal who renounced his Indian status at the time of their marriage, lost her Indian status, and this loss of status, in some cases, made her eligible to vote. Yet a non-aboriginal woman who married a status Indian automatically became a status Indian, and this change in her status meant that her right to vote might be lost. The biographies dealing with women’s suffrage at the federal, provincial, or municipal level have been placed in the corresponding section. Biographies that do not specify a level of government are to be found in both the section on federal elections and the section on provincial elections (listed by the province or territory of residence). The most recent complete volume of the DCB/DBC, volume XV, brings together the biographies of persons who died between 1921 and 1930 or whose last known activity dates from that period. As of 30 June 2016, more than 160 biographies in volume XVI (1931–40) had been published online. Even though each week a biography belonging to a volume in preparation is added to the DCB/DBC, many biographies of women at the heart of the fight for women’s suffrage, such as Louise Crummy (McKinney) (volume XVI), Carrie Matilda Derick (volume XVII), and Thérèse Forget (Casgrain) (volume XXI), have yet to be published. A list of suggested readings is provided to help fill in some gaps and guide readers who are interested in learning more. Each relevant biography published online will be incorporated into this thematic ensemble.